Toilet paper, hand soap and paper towels – The new house may not have any so it is best to come prepared. Cash – You’ll want to tip your movers and probably order a pizza or two. Small tool kit – You may need your tools to open boxes or putting things together. Chargers and power strips – You’ll probably need to “plug in” things while unpacking. The chargers can keep your phone and other devices working. Soap, toothpaste and toothbrush – You should have easy access to your grooming kit and towels. Home cleaners – Hopefully, the former homeowners left your new home spotless, but just in case, it is a good idea to have some cleaning products handy: all-purpose cleaner, Clorox wipes and paper towels! Snacks – Unpacking is hard work. You’ll want to take a break with some liquid refreshment and snacks. Kitchen survival kit – If your dishes are packed away, it is good to have some disposable utensils, paper plates and cups nearby. A small box with kitchen supplies is not a bad idea, either. Include a can opener, cutting knife and a medium-sized pot. Pet food – The pooch or kitty needs to eat! Meds – Keep all medications that you take daily in your car. 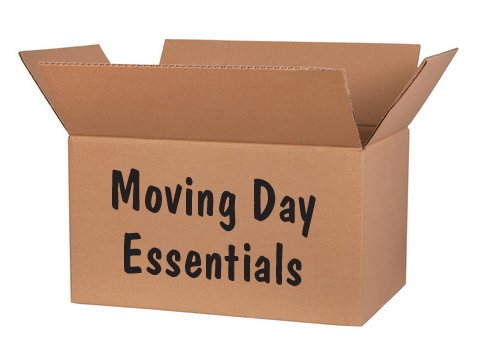 This entry was posted in Buying A Home, Moving For Love, News and tagged Moving Day Essentials, Moving Day Tips by susanaknabe. Bookmark the permalink.